“Devil Dog: The Amazing True Story of The Man Who Saved America,” by David Talbot. Illustrated by Spain Rodriguez. New York: Simon & Schuster, 2010. “Devil Dog: The Amazing True Story of The Man Who Saved America” is a biography of Smedley Darlington Butler, one of just nineteen American military men to be awarded the Medal of Honor twice, and it is indeed the amazing true story of a man who saved America. Is there any taller tale to be told in U. S. history? 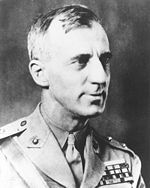 Born into a family of Philadelphia “bluebloods”—both grandfathers were prominent bankers, his father was a powerful U. S. congressman—Smedley Butler served 34 years in the Marine Corps. His personal story is enmeshed in his country’s transition from a democratic republic to an imperial military power. Butler’s greatest hour occurred in 1934, when he revealed to the United States Congress that he had been asked by Wall Street financiers to lead a coup against President Franklin Delano Roosevelt. Long before Smedley Butler became “the man who saved America,” he was a foot soldier for a military force engaged in action on more than one continent. Butler began to make a name for himself in 1900, when, at 18 years of age, the Marine Corps Lieutenant commanded a company of 45 enlisted men who fought in China during that country’s Boxer Rebellion. Spurred by imperial-minded politicians and a hysterical international news media, Austria, France, Germany, Great Britain, Italy, Russia and the United States all sent military troops into China in order to capture Chinese treasure. Butler and his American troops were the first to fight their way to the very walls of the “Forbidden City”—the center of Chinese political power in Peking. Ready to enter, the Americans were told to “stand down” from their final assault because their allies wanted to make sure that they would share in the plunder. Twelve years later, Major Smedley Butler found himself at the forefront of a U.S. effort to squash a burgeoning democracy in Nicaragua. Butler secured the success of the American campaign by singlehandedly convincing the leader of the Nicaraguan resistance movement to surrender. But his military superiors would rotate Butler out of the country in 1918. He never rose above being the symbol of America’s occupation force that would rule Haiti for nearly twenty years—and doom the country to a century and more of political and spiritual impoverishment. In World War I, Butler commanded the U.S. Marines’ 13th Regiment. After a nightmarish trip across the Atlantic Ocean, the “Hoodoo Regiment” arrived at Camp Pontanezen, where 65,000 soldiers were crammed into a camp built for 1,500. 12,000 soldiers were sick with flu. Hundreds were dying each day. After being appointed commander of the camp shortly before it became an international scandal, Butler, though sick himself, blew past protocol and quickly transformed Camp Pontanezen into a model military facility. As a result of his Herculean lifesaving effort, Butler was awarded both the U.S. Army’s and Navy’s Distinguished Service Medals and was promoted to the position of brigadier general. He was 37 years old, the youngest brigadier general in Marine history. Butler went on to become a crusading crime fighter in Philadelphia during Prohibition, a leading spokesman for American World War I veterans who were betrayed by their country in the darkest hours of the Depression, and a coveted front man for a Wall Street military coup intent on overthrowing first-term President Franklin Delano Roosevelt. Smedley Butler’s life story reads like the most outlandish of Hollywood’s mythmaking scripts. racketeer, a gangster for capitalism. I helped make Mexico . . . safe for American oil interests. I helped make Haiti and Cuba a decent place for the National City Bank boys to collect revenues in. American republics for the benefit of Wall Street. Banking House of Brown Brothers in 1902-1912.
the American sugar interests in 1916. Standard Oil went on its way unmolested. Marines operated on three continents. In his 1960 presidential Farewell Address to the nation, President Dwight David Eisenhower, another American military hero, exposed his country’s military-industrial complex, that juggernaut of greed and social exploitation that has kept the United States of America involved in an endless string of wars and a perpetual war footing since World War II. The story that David Talbot tells in Devil Dog is as pertinent to the American scene today as it was one hundred years ago. Our national democratic spirit continues to suffer as a result.